One day. One world. One message. 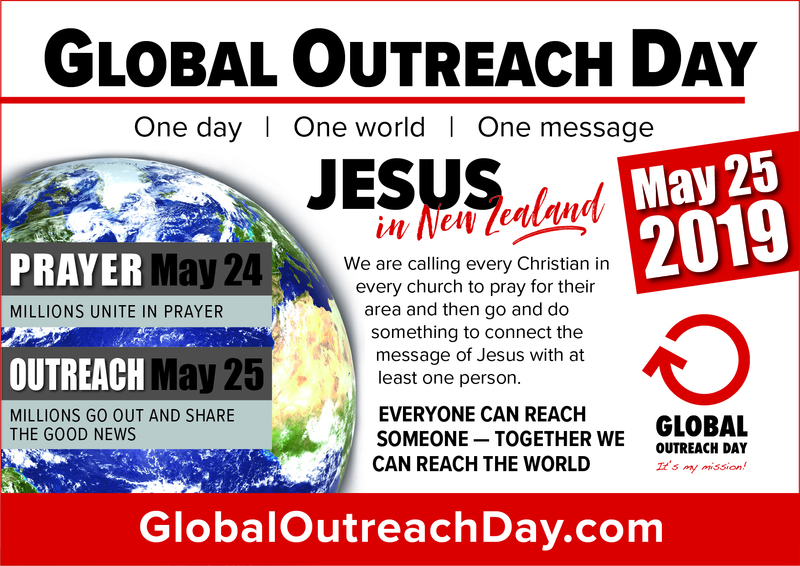 Global Outreach Day is the largest outreach mobilisation effort in human history. Believers everywhere, annually trained and mobilised. NZ, Australia and Pacific plans are below. 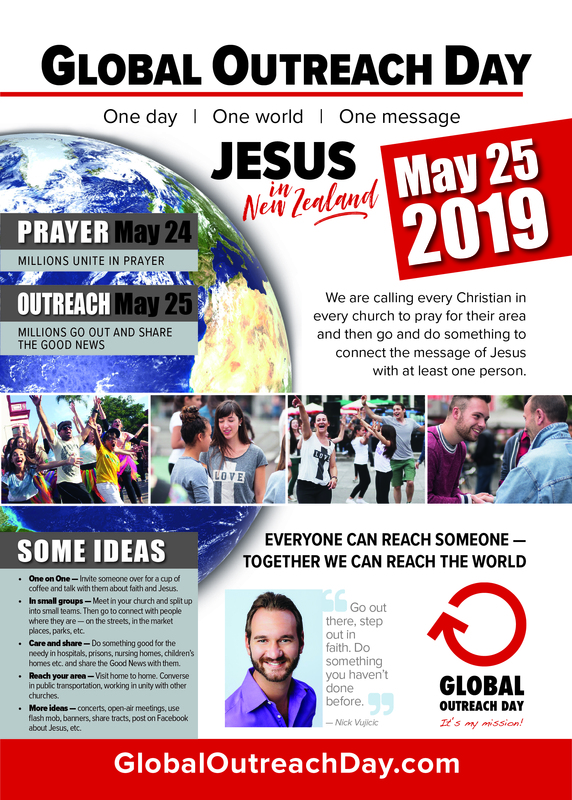 The 2020 Global Outreach Day vision is to see 100 million believers mobilised to connect the Christian message with 1 billion people in the month of May 2020. Many partnership with national Church leaders, and international TV preachers, organisations and evangelists are being established for this. God’s people are lining up to work with some quite remarkable unity! The SLT passes information to 25+ outreaching organisations within NZ annually, encouraging their participation. Basic radio and print ads are created and sent annually to various publications, in case they are willing to place them. Lew Meyer of OAC has worked with Dave Mann (SLT) to encourage regional equipping days a week prior to G.O.D. In Australia, Stu Millar is the national coordinator, and is duplicating the above efforts, while also traveling to meet groups of pastors to encourage utilisation of the opportunity, while equipping all members for conversational outreach through the pulpit and small group. G.O.D. has also been started in Samoa – with Morgan Ezra Gegera (EHC) are the national coordinator, supported by Ps Samoa Unoi (Peace Chapel). Roy Funu promotes this annually in the Solomon Islands – while empowering Pacifica peoples at a pacifica conference he runs annually at the same time (hosted in Vanuatu and then the Cook Islands the previous two years). A fun Pacifica celebration is planned for 2020, including cultural dances from half a dozen nations, followed by testimonies. An international Christian TV station is looking to telecast this as part of a 24 hour programme about Global Outreach Day 2020. For pastors - What do we do? The goal is that people reach at the least ONE person with the Gospel on Global Outreach Day! …though any effort to do something new is surely a ‘win’ for you and your church! or extending an invitation to a local outreach event. Encourage your members to do something that will work for them – or to try something that they haven’t done before. TO PROMOTE TO YOUR MEMBERS: Download an 2018 NZ A5 flyer here (or a print-ready version with a ‘bleed’ for mass printing here), an A6 ad here, and use the promotional video found at the top of this webpage. HOW SHALL I TRAIN THEM? The week(s) before: Equip and mobilise through the pulpit and small group. Sunday: Preach the gospel so that people who are invited can understand it. Have coffee or a meal with people who have expressed interest in learning more. Two weeks later: Send a report to us, with statistics, so we can track national growth and developments (admin@shininglights.co.nz). The AllTogether/Hope Project team facilitate this in the Bay of Plenty. OAC (Lew Meyer — lew@oac.org.nz) facilitate these in a number of other provinces. A key international resources is the ‘3 steps’ training booklet: This is written, and regularly updated, by the founders of Global Outreach Day. What report questions will be asked after G.O.D. annually? How many were equipped reach out? How many went to reach out? How many different people were engaged in a gospel conversation as a result? How many heard the gospel? How many responded to receive Christ? Could you please tell us some encouraging stories from this so we can encourage others. 2017 was the first year that NZ Churches participated in Global Outreach Day (G.O.D.). G.O.D. was given profile in NZ via Christian radio to about 200,000 evangelicals, as well as promotion in person to about 1000 pastors in 2016. It was recognised as a day on which to encourage those who pastors are equipping to take new steps. It was also utilized in several places as an opportunity to have evangelism training for those who are ready to reach out to people they do not know (beyond their own friends and colleagues/neighbours). We had no idea how many places participated – however through my travel I am already encountering churches (like a couple of the below) who did things out of their own motivation, on the basis of simple awareness. In 2018 the effort was promoted to 20+ organisations and Rhema Media promoted it through their three national radio channels and Shine TV. 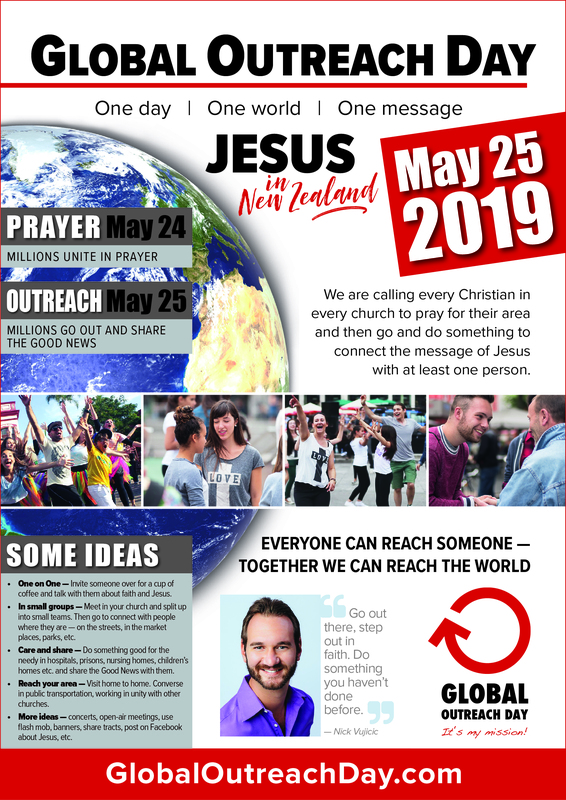 Because the Hope Project had taken the gospel to most Kiwi homes at Easter, few extra events were organised. People were encouraged to complete personal visitation to gift Hope Project booklets to ‘no circulars’ homes throughout the nation, who would not have received them through the national delivery. This pattern is likely to continue in 2019. Meanwhile OAC’s ministry in evangelism training in Pacific nations is increasing. While not branded as G.O.D. this is achieving the goal. It remains a hope that G.O.D. might be more on the radar of believers in Pacifica nations. People always say they will evangelize tomorrow. G.O.D. makes it ‘today’ (2 Corinthians 6:2). It is a simple effort that can have a significant effect.